Do Shinzo Abe’s Defense Initiatives Matter? How Japan’s new civil-military relations change its security posture and policy. In a recent article published in The Diplomat, Robert Dujarric argues that the revamp of Japan’s defense legislation by the cabinet of Prime Minister Shinzo Abe has far slighter consequences for the security posture and policy of the country and for the potential use of the Self-Defense Forces (SDF) abroad than most stakeholders and observers assert. The heart of his argument is that since the creation of the SDF during the 1950s, the Japanese armed forces could have been used for any scenario, from defense to aggression, given favorable domestic and international circumstances. In case of international tensions affecting directly the country, a government supported by its population could have used the SDF in any manner irrespective of the defense legislation in force. In other words, legislation is always flexible when it comes to urgent situations that put at risk the security of the country and its population, the executive being able to overcome legal hurdles through the reinterpretation or revision of laws, or the enactment of emergency bills. As such, the impact of the current revision of Japan’s defense legislation must not be overstated. That argument is rational, and important as it puts into perspective the highly polarized and often passionate debate around the revision of Japan’s defense legislation, amid Abe’s rush to enact the bills by the end of the current parliament session, which has now been extended. However, in addition to the fact that legislation is never as weak in the face of realpolitik as Dujarric asserts, providing the opposition with arguments to counter the initiatives of the executive, the argument misses the point. The current debate, especially among English-speaking commentators, has focused on the most visible changes in the defense legislation, such as those related to the right of collective self-defense, the geographical restrictions for the use of the SDF, and the latter’s participation in peacekeeping operations. The legal revisions enacted or to be enacted in these domains hide initiatives being pursued by the Abe cabinet with much more profound consequences for Japan’s security policy and posture, because they will determine to a large extent the way the current and future governments use the new defense legislation and the SDF. In other words, a structural reform of Japan’s defense architecture with far-reaching repercussions is being implemented under the legal surface. These initiatives are revamping the structure of civil-military relations in Japan. The two main changes in this regard are the establishment of the National Security Council in late 2013 and the recent revision of the internal regulation of the Ministry of Defense, approved by the House of Councillors on June 10, 2015, following a similar decision by the House of Representatives. The revision of the ministry regulation puts on equal footing military personnel and civilians in assisting the defense minister. Under the previous regulation, senior defense bureaucrats were the only ones responsible for supporting and advising the minister in his duties and in his interactions with the government, the chief of the Joint Staff, and the chiefs of staff of the maritime, ground, and air branches of the SDF. A second aspect of the revision places operational planning under the responsibility of the Joint Staff, while this was formerly the task of a ministry bureau to be abolished under the new regulation. The National Security Council is dedicated to reinforcing the influence of the prime minister and improving coordination between key actors on the formulation of security policy and foreign policy related to the security of Japan, serving as the main decision-making organ in this regard. The new body takes over the Security Council of Japan established in 1986, scaling down the number of officials involved in the decisions-making process from nine to four. The National Security Council comprises the prime minister, the foreign and defense ministers, and the chief cabinet secretary. What do these initiatives imply in terms of civil-military relations? First, the influence of uniformed personnel compared to their civilian counterparts inside the defense ministry, and on the minister himself, is going to increase. For obvious historical reasons related to the right of supreme command, granted to the Japanese military until the end of the Second World War, the fact that operational planning is placed under the responsibility of the Joint Staff has triggered much concern in Japan about the civilian control of military affairs. It remains that the equilibrium between military personnel and civilians in assisting the defense minister in his duties certainly constitutes the most important aspect of the new ministry regulation, because it expands the leverage of military experts inside the ministry and on the minister. This expanding influence of military experts inside the defense ministry and on the minister also affects the government, although indirectly. The defense minister is the representative of the military institution in the cabinet. As such, he is both the authority by which government decisions are passed down to military personnel and a channel of communication through which the government receives insight, advice, and demands from the military institution. This latter role makes him a vector of military influence directed towards the government. Consequently, if military experts gain leverage inside the ministry and on the minister, they expand their influence on the government. To these consequences of the new ministry regulation is added the growing importance of the defense minister in developing the security and foreign policies related to Japan’s security. This is because the creation of the National Security Council reduces the number of persons, let’s say entities, primarily responsible for security affairs to just three: the prime, foreign and defense ministers, the chief cabinet secretary being mainly in charge of administrative matters. The foreign and defense institutions, the only two ministries permanently represented in the council, are put on equal footing in their tasks of advising the prime minister on security affairs and their ministers thus possess important leverage over the latter, greater than inside the previous Security Council of Japan. Then, the question is: What are the possible consequences of these changes in civil-military relations for Japan’s security posture and policy? Governments comprise generalists who need advice and guidance, not only to formulate proper foreign and security policies, but also to understand the implications international developments have for their country. This is the reason why they call upon specialized institutions to express their views on specific topics. In the case of Japan, the establishment of the National Security Council is precisely dedicated to providing the prime minister with more accurate and timely information on regional and international developments potentially affecting Japan’s security. Specialized institutions, which possess their own interests and biases, are both advisers of governments and sensors through which the executive perceives the international environment. Consequently, the nature and orientation of a country’s foreign and security policies change depending on the institutions taking part in the decision-making process, their relative influence on the government, and the stance they adopt. 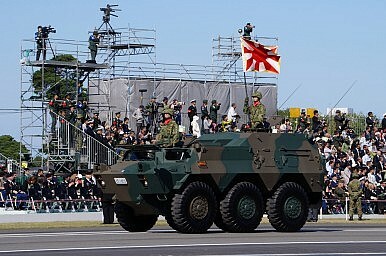 In Japan, the reduced number of institutions involved in this process following the creation of the National Security Council and the growing leverage of military experts on the adviser/sensor defense minister will change the perspective the Japanese government has of its environment, as well as its approach to national and regional security. Military experts possess important institutional biases. They tend to disregard diplomatic affairs, to assume the worst of other countries’ intentions and, building upon this assumption, to provide advice and insight to governments based on pure military logic and on the relative military capabilities of countries. These biases are natural and in some ways necessary features of military experts, who need to be prepared for any contingency in case the foreign policy of the government fails to settle or mitigate disputes by peaceful means. Given the recent modifications in civil-military relations described above, Japan’s security policy is likely to be increasingly influenced by these biases. The sensitivity of the country to external threats is going to grow, its security posture will become more independent from other countries, including from the United States, and armed forces are going to assume a more important place in its security policy. In short, the structural changes in civil-military relations will have significantly greater consequences for Japan’s security posture and policy and for its regional role and positioning than the reinterpretation of a constitutional article or the revision of defense legislation. Lionel Pierre Fatton is a Ph.D. candidate in International Relations at Sciences Po Paris, and a correspondent for the Japanese news agency Kyodo News at the United Nations Geneva headquarters.